Melanddi was a hugely successful high fashion shoe and clothes shop born at the end of 78 and went through the early 1980´s until 1986. 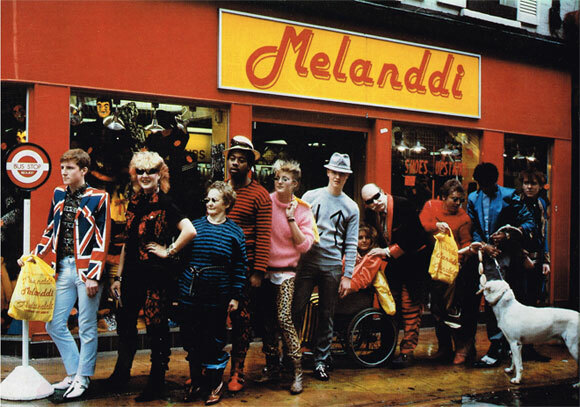 At its height Melanddi had 5 shops, 10 & 43 Carnaby St, Gt Marlborough Street, (which is the entrance to Carnaby Street), South Street Romford, Essex, and a shop in Martineau square in the middle of Birmingham. The shops were crammed full of high fashion shoes and clothes for men and women. It was also crammed full of the pop groups of the time. Most importantly, it was crammed full of “The Dedicated Followers of Fashion”, Our customers. This website isn´t the definitive Melanddi website. Its just a taster. A reminder of what Melanddi was. And, what a pair of council house boys created back some 30 odd years ago. It also shows how the styles of both music and fashion moves, but doesn´t move, evolves and regresses, but appears brand new to a whole new army of followers who believe they are the pioneers. But this is the way of the world. We all think we´re Peter Pan. And then discover we´re not. I will also explain how the new Andy of Melanddi label has come about, which is a story of coincidence, and a long standing love of Fashion and Music, the two virtually inseparable. Read on. If you´re not already asleep.